I noticed this book won an award a while back so I put it on my TBR but have just now had a chance to read it. I'm glad I finally did though. It's one of those stories that will make you appreciate all the things you have and take for granted on a daily basis. It's set on the Gulf Coast in a post-oil dystopian world which I did not realize until I started reading and I was a little confused at first because the author doesn't give any background upfront on the alternate world and characters. That part is pretty much overlooked until toward the end of the book so it did take me some time to figure out what a lot of the terminology and roles were of the supporting characters. As for the story itself, it's about a boy named Nailer, who lives in a shanty town on Bright Sands Beach and works on the "light crew" scavenging copper from wrecked oil tankers. The whole beach area where he is from has been devastated by extreme hurricanes and is now poor and rife with crime. Nailer is desperate to get away from that life and his abusive, alcoholic father and is always hoping that his luck will change for the better one day. 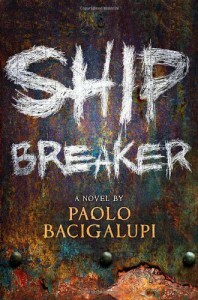 Then another bad storm occurs and a wealthy clipper ship wrecks on their beach and Nailer is faced with having to decide whether to help the only survivor on the ship or help himself survive by scavenging the ship before anyone else gets there. There is more to the story then that but you'll just have to read the book because I don't want to spoil it. All in all, it was a good thought-provoking story but I definitely think there should have been more background given on the alternate world and supporting characters. The author does a really good job though of developing the main characters and setting the atmosphere. He paints such vivid descriptions of the struggles and hardships the main characters face which helps you sympathize with the decisions they have to make to survive. If you are ever in need of a reminder of how good we really have it, you should definitely read this one!